To celebrate the premiere of Game of Thrones’s first episode, let’s turn our eyes to the past. While Game of Thrones is known for layered characters, political intrigue, and unexpected deaths, its no doubt the series has some kickass action scenes too. Its eye for spectacle has only grown since the show’s early days, creating massive battle scenes that normally would be reserved for an epic movie like Lord of the Rings. Here are (in our opinion) the top five best ones! This attack came out of nowhere, both for the audience and the characters. Following House Lannister’s victory over the Tyrells, the Lannister caravan, led by Jamie and Bronn were returning home with loot they had taken from Highgarden. That’s when the ambush happened: Dothraki forces charged over the grasslands, attacking the Lannister caravan en masse. Then Daenerys herself descended on the back of her dragon, Drogon, and unleashed Hell on the soldiers below. The terrifying results of a dragon attack are realized first hand, as the action follows Bronn stumbling through the flaming wreckage of the attack, stumbling past his fellow soldiers burning alive in a scene of complete chaos and frenzy. Only Bronn managed to shoot Drogon with a lucky shot drives the dragon off, but no before Jamie charges the dragon with spear in hand, a badass moment even if he doesn’t succeed and nearly drowns for his troubles. The moment where Game of Thrones truly showcased the threat of the White Walkers, the undead army descended upon the fishing village of Hardhome in force. As the Night King watched like some sort of dark god from the cliffs above, the wights were unleashed upon the village, overwhelming the wildlings and slaughtering everything in sight. Filmed as chaotically as possible, the sequence captured the unstoppable nature of the enemy first hand and allowed Jon to duel a White Walker one on one amidst the frenzy. And of course, the unforgettable image of the Night King raising all the villagers he’d just killed as zombified servants in the battle’s aftermath will forever linger in our minds. This one was one for the books. A battle so huge and massive an entire episode was devoted to showcasing it in all its glory, the Battle of Castle Black featured the wildlings assault the Wall, facing off against the badly outmatched forces of the Night’s Watch. Crowd pleasing moments were flowing from the episode: giant mammoths! A huge scythe bursting from the Wall to sweep off wildling climbers! The death of Ygritte! And of course, the epic tracking shot that followed all the major characters through the battle, showcasing their individual struggles amidst the madness. This one is pure excitement and features some of the best action the show has ever had. 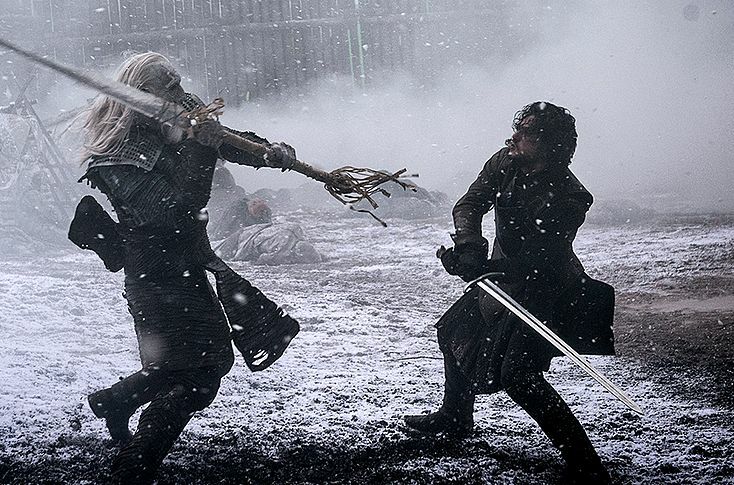 The showdown with Ramsay Snow was built up off over multiple seasons, with the audience growing more and more desperate to see the evil man meet his end. And the Battle of the Bastards did not disappoint. Jon Snow leads his forces against Ramsay’s own to retake Winterfell from House Bolton and the action kicked off from there. The visual component truly captures the frantic combat of a battle scene, with Jon stumbling around the battlefield, swiping madly at opponents as horses charge, men die, and the entire scene turns into a blur. At one point, Bolton forces trap his army and as the bodies pile up, Jon Snow is nearly buried in an avalanche of corpses. This leads to the crowd cheering moment when Sansa arrives to save him, leading to the routing of Bolton forces back to Winterfell and Jon finally beating the utter crap out of Ramsay. The aftermath of the battle was even sweeter: watching Sansa take revenge on Ramsay and allowing the sadistic villain to be eaten alive by his own dogs. The first of Game of Throne’s epic battle scenes and ultimately, still the best. Pitting Stannis Baratheon against the Lannisters, our sympathy and focus ultimately goes to Tyrion, whose trying to defend his home despite the machinations of his relatives. The battle featured one of the most iconic moments of the series, where Bronn, at Tyrion’s orders, ignites wildfire in the bay and blows almost all of Stannis’s fleet to Hell. Of course, the battle isn’t over yet, Stannis leading the reminders of his forces onto the beach and laying siege to the keep. He almost gets inside too, but Tywin arrives at the last minute, saving King’s Landing and getting credit. But we all know Tyrion was the real hero of the day. Blackwater set the standard for what was to come but still holds up today and we’ll never forget the images and the tension it crafted. What are your favorite Game of Thrones battles? Tell us in the comments!